To learn more about the grant program, send questions to aauwgrant@hotmail.com. Applications are available from the financial aid offices at Drew and Fairleigh Dickinson Universities, as well as at the College of St. Elizabeth in Convent Station and County College of Morris. The applications are also available at the reference desks of the libraries in Chatham, Florham Park, Madison and Morristown. Completed applications must be received by the Grant Committee on or before March 31, 2019. 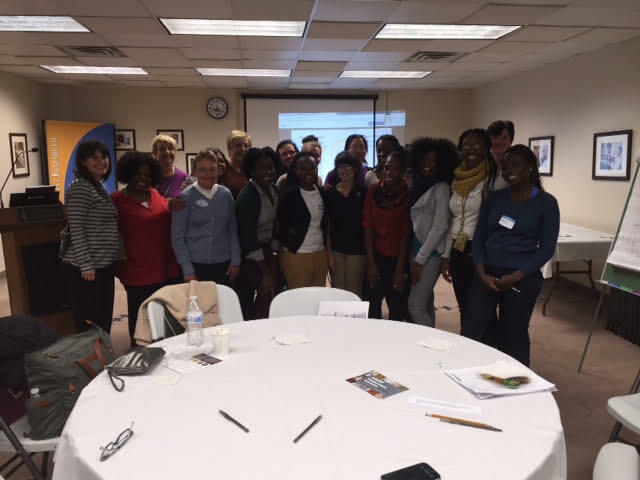 Susan Mennella & Loretta Harris represented AAUW Madison branch on Monday evening, October 19th 2015, during our $mart $tart workshop at the College of Saint Elizabeth. Over 50 students and faculty were in attendance for this wonderful event. AAUW’s Start Smart and Work Smart programs are designed to empower women with the skills and confidence to successfully negotiate their salary and benefits packages. By learning strategies and practicing effective language, participants gain valuable skills they can use throughout their lives — well beyond their next negotiation. 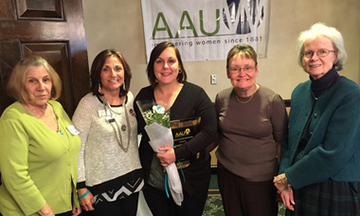 At the April 11 meeting of AAUW-NJ (State Organization of the American Association of University Women) Beth Krawczuk, co-president of AAUW Madison Chapter received one of the “Women as Agents of Change” awards from state president, Carol Cohen. Elizabeth “Beth” Stuehler Krawczuk has spent her entire adult life working in the male dominated technology field. She is currently a Senior Programmer/Analyst with Lab Corp. Via her professional career and her volunteer work she is constantly advocating for women and girls. Her mission is to empower girls to fight stereotypes and follow their dreams to pursue STEM education that she believes will likely lead these young women to pursue STEM careers. Krawczuk, a resident of East Hanover, with deep roots in Madison, has worked for positive societal change in her professional career and in her volunteer work. She is a very active member of Madison AAUW and under her leadership the branch has embraced STEM initiatives. She also volunteers with the Girl Scouts where she promotes STEM activities, helps with fund raising and worked with the girls on life skill building activities. As an AAUW member, she has served in different leadership roles. She is a past Recording Secretary for the Madison Branch and the current branch STEM Chair as well as Co-President for the branch. In her four years of membership in the organization she has taken part in and supported AAUW activities at the local, state and national levels. Her passion to encourage girls to embrace STEM education comes from her almost 20 year career as a web programmer. She noted that “I have been fortunate in my career, but still, the struggles I have encountered, being a woman in this male dominated field, are the very common lack of support for advancement from employers and the difficulty in finding a mentor.” But her passion is also from deeper inside; Beth was so proud of her mom’s (Angela Stuehler – former AAUW Madison Branch President) dedication to the AAUW and empowering women through education that, after she passed away, she felt compelled to continue her legacy.